Glemsford is a funny place and no mistake, and I'm not only saying that because I married into a Sudbury family. Mention Glemsford to older Sudbury people and they'll shake their heads like my father-in-law does and observe something along the lines of 'they're funny buggers in Glemsford'. In the hothouse of industrial late medieval Suffolk, Glemsford was an equal partner with Melford and Sudbury, but it has become something of a backwater over the last half a millennium or so. There is still a large factory down on the main Melford to Clare road, and a feel in the village itself that something industrial happened here once, but otherwise not a lot seems to be going on, and the little that does happens slowly and quietly. Not that there is anything wrong with that, of course, and if Glemsford is not one of the more attractive Suffolk villages it still at least has its shop and its school. 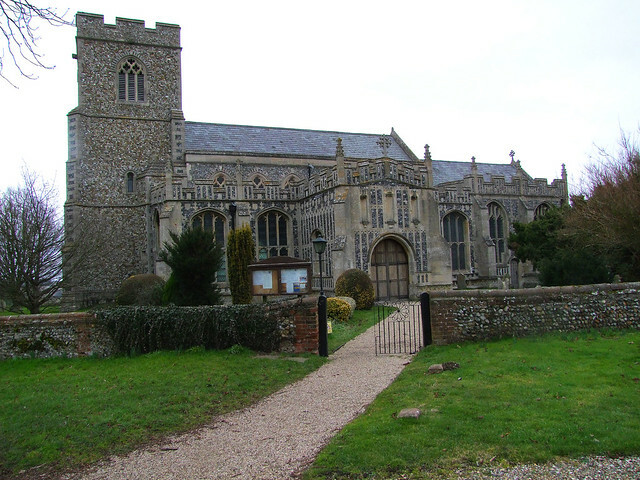 And, of course, its church, although perhaps the church is not quite the centre of its community in the way that many other Suffolk churches are. Why do I say this? Well, so often in a Suffolk village you can step into the church in search of a sense of the numinous and perhaps the genius loci, often discovering that someone else has had the same idea, but at Glemsford there's a sign that says this church is open for viewing on Tuesdays during the school term during school hours. At all other times please contact the churchwarden. You'd think that they didn't actually want you to go inside. So I rang the churchwarden, whose number I found after a search of the other notices. As you've probably guessed, he was out. I rang the rector. He's been there years and years - I got the key from him on my previous visit back in 1998. I thought I heard a faint sigh - perhaps he was used to this happening. He made a phone call and arranged for someone else to come and open up. Then I remembered him telling me fifteen years ago that the congregation was too small to provide anyone to open and close the church each day, neatly sidestepping the reason why he didn't do this himself. Presumably, it hasn't got much bigger in the years since. While we waited, we took a wander around the churchyard, which is tight on the south side but opens out widely to the north, the rolling hills beyond the churchyard reminding me that the highest point in Norfolk and Suffolk is just a few miles off. The exterior is a curiosity in itself; the fabulous porch, chancel and south aisle were obviously the result of serious money on the eve of the Reformation, but a dull-handed 19th Century restoration gave us a characterless recladding of the tower tower and clerestories. There is a feel of what might once have been. There is a haunting dedicatory inscription on the south side of the chancel. The beginning of it has been erased by iconoclasts, but obviously said PRAY FOR THE SOULS OF. It then continues JOHN GOLDYNG & JOAHN HYS WIFE THE FOUNDERS OF THIS CHAPEL AND IYLAS (aisles). A further part has been erased - possibly LORD HAVE MERCY? Having exhausted the possibilities of excitement, we waited in the wintry chill for the key. The bloke, when he came, was very friendly and cheerful - "I've brought m'paper, you take your time!" - and so I stepped into All Saints for the first time in 15 years. There's not a lot to see. The inside is bright, attractive, overneat. Interestingly, the arcades do not match; one is higher than the other, an indication that the aisles were built as part of slightly different projects. The roof above them dates from the 1870s, as does that in the south aisle. But that in the north aisle is the medieval original, and very lovely. Probably, it was completed as part of John and Joan Golding's bequest in the early 16th Century. There is a battered old font with a representation of Mary at a prayer desk, presumably part of an Annunciation scene. And the fat bull of St Luke is rather jolly. But really, there's not much evidence of this building's glorious past. However, I'm still bound to ask how an English church which was at one time significant can now be kept locked. What kind of an act of witness is that? We said our farewells. It was with something like relief that we headed back down from the hills towards Melford and civilisation.